This traditional African value and ancestral teaching coincides with the core HeartMath principle that we are all interconnected. It also figures prominently in a South African researcher’s study of the HeartMath System of tools, techniques and technology and his ultimate advocacy of its effectiveness in promoting global healing. “(HeartMath) provides evidence for the value of psychophysiological and global coherence,” Stephen D Edwards, professor emeritus of the University of Zululand, KwaDlangezwa, South Africa, wrote last year in a Journal of Psychology in Africa article about the study. This evidence prompted Edwards’s research of HeartMath principles and methods. His subsequent study, published in August 2015, is titled HeartMath: a positive psychology paradigm for promoting psychophysiological and global coherence. SHISO, an African Approach – Edwards said the foundation for his interest in HeartMath derived from the effectiveness of an African breath-based, heart-focused psychotherapeutic approach called SHISO. SHISO is an acronym for spirit, heart, image, soul, and oneness. SHISO, he explained, is as an approach that honors a perennial form of psychology practiced in Africa that has particular human, spiritual, transpersonal and communal dimensions. It was only after studying SHISO for some time that he learned about and took an interest in HeartMath Institute (HMI). The Global Coherence Initiative’s South African Presence – Edwards notes there have long been traditions such as Christianity, Hinduism, Judaism and Buddhism among others that have relied on some form of heart focus for advancing global healing. He offers HeartMath’s argument that the Global Coherence Initiative (GCI) may be the most highly scientifically grounded effort that incorporates such a focus. Beginning in 2013, Edwards said, during his research he came across HeartMath, and decided to undertake a literature review of the HeartMath Institute Research Library. He communicated with HMI Director of Research Rollin McCraty and began collaborating with HMI from 2013 through 2015. He examined evidence that he said supported the effectiveness of HeartMath methods in South Africa. His work included incorporating HeartMath’s tools, techniques and emWave® technology and some SHISO methodology. 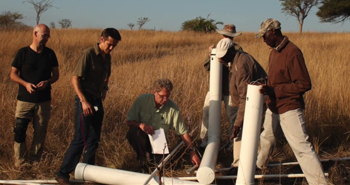 “Further research collaboration with the HeartMath Institute led to the establishment of the African Global Coherence Initiative magnetometer on a private game reserve in Kwa-Zulu Natal,” Edwards said. The Kwa-Zulu Natal site, established in 2015, is part of GCI’s Global Coherence Monitoring System (GCMS). It is one of six sites currently operating at various locations around the world. Each site is equipped with state-of-the-art magnetometers that provide a constant stream of information on changes in the earth’s magnetic field. This information is contributing to GCI research on mechanisms involved in how the earth’s various fields affect human physiological, mental and emotional processes, health and collective human behavior. Eventually, there will be about a dozen such sensor sites. “HeartMath research provides substantial evidence for the key role of various levels of heart – physical, mental and spiritual – in emotional experience, psychophysiological, social and global coherence. Edwards said future research on psychophysiological and global coherence and the Global Coherence Initiative itself have great potential for helping humanity and promoting global health and well-being. View Video, South Africa Global Coherence Monitoring System Installation in KwaZulu Natal province.